around Joanna Terrace and Jean's Way on Saturday and Sunday. If you live in that area, please keep a lookout. 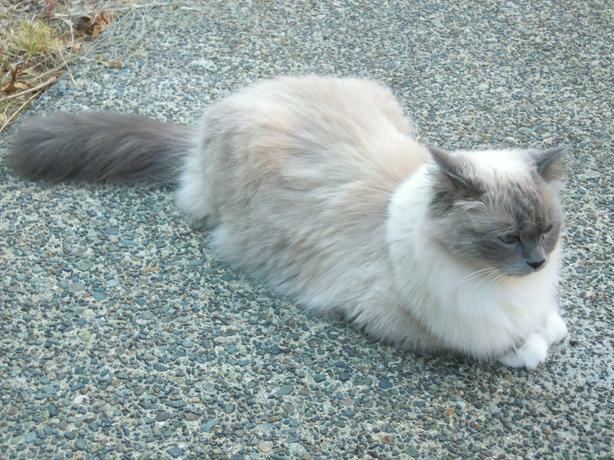 7 year old female Birman by the name of Sneakers - tattoo of bird in right ear. She is friendly but probably scared. Lost on Rosstown Road (at Sun Valley Drive). This is highly unusual for her to be gone so please check all outbuildings, sheds, garages, basements, or any place she might have gone intoand the door closed. She never ventures far from home and always checks in every half hour or so but she is curious so she may have gone into a shed or basement and not been noticed.